It's been a hot minute since last we reviewed a movie. To be fair, the releases slow to a trickle between Christmas and New Year's and allow us all to catch our collective breath before the new year's new films start to unspool. Interestingly, this week gives us a different sort of holiday film to cherish, The Oath. Thanksgiving films are seemingly few and far between, but they usually deliver more bang for their buck. See Planes, Trains and Automobiles, Pieces of April, Dutch, Home for the Holidays, etc. There's just something about Thanksgiving that screams family dysfunction. While Christmas is more the holiday where everyone gets along for better or worse, there are no rules when it comes to Thanksgiving. It's the uncomfortable uncle of holidays and my family unabashedly celebrates it like no other. So, with this in mind, I reviewed The Oath with the understanding that I would probably relate way too much with the events of the film. Thanksgiving is a time where the family gets together and with so many different political viewpoints, emotions are kept in check by a regulated amount of alcohol. For Ike Barinholtz though, no amount of alcohol is enough to keep his emotions in check when a new pledge of loyalty to the President puts him on edge and in direct opposition to his family members. The hostility escalates when two Citizens Protection Unit agents show up to enforce his patriotism. I have always enjoyed Ike Barinholtz in small increments, but he has gradually seen his roles increase culminating in a co-starring gig in last year's Blockers. The old saying about less being more might be fitting here as it seems that Ike has a tendency to go too far at times and in The Oath he's given full reigns as the writer, director, and star of the film. At times, his progressive character of Chris is drop-dead hilarious as the embodiment of a liberal protagonist caught in a conservative state that feels more like a precursor of a police state more than today's political landscape. Of course, Ike takes things over the top as he is wont to do and things spiral quickly out of control. What starts out as a funny, scathing look at a slightly dystopian view of today's political climate, turns into a farce that resembles The Purge more than Wag the Dog. And yet, there is veritable comic gold sprinkled among his talented cast that demands attention. Tiffany Haddish is relatively laid back as his wife and yet, she continues to steal almost every scene that she is in. I only recently discovered her last year, but she continues to impress and her comic restraint here is admirable and allows her character to be the moderate raft in a political quagmire. While it's obvious that Ike Barinholtz has a lot to say about our current political status quo, he ultimately undermines his jabs with a diabolical second half of the film where the rails come off and it's a full out battle royale. Of course, this could simply be a cautious metaphor for own future if we don't step up and get involved in the political discourse. The brilliance of The Oath lies in the fact that while the unseen President is a conservative, the wackiness of the progressive response is given equal treatment. Overall, the film is pretty balanced in presenting the extreme opinions on both sides of the political aisle, so much so that by the time the film reaches its implausible conclusion, the real revelation is that we might finally understand that we have more in common with those who don't share our political beliefs than we thought. Of course, along the way, it's important to laugh and point out these absurdities on both side and The Oath has that in spades. 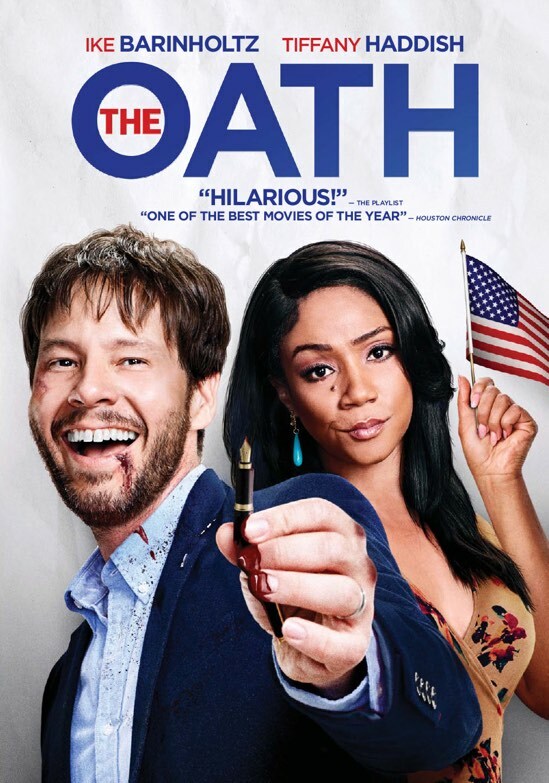 The Oath is now available on DVD.